Enjoy the beauty of healthy trees and lawns with us helping you to evaluate "ALL" your tree and lawn care needs. Give us a chance to help with "ALL" your tree and Lawn care needs, you will be pleased with our services. We offer Expert Tree and Lawn Services at Affordable Prices, from removing dead or diseased trees to trimming overgrown or hazardous trees and delicately pruning valuable fruit trees, to mowing your lawn, cleaning gutters, installing "hardscapes", mulching and so much more. Our skilled technicians can recommend the most beneficial treatments, with a dedication to prompt, high-quality services at dependable and affordable prices and care and concern for your property. A Top to Bottom Tree & Lawn Service - Hampton Roads Tree and Lawn Service Specialist, is proud to meet all of your tree service needs. Landscape design, hardscapes, borders, river rock, bolders, mulch, pavers, stepping stones, gutter cleaning, pressure washing, debris/trash removal, fence removal, installation and repair, top soil and grading. Your satisfaction is our priority, and we offer free, on-site estimates for both residential and commercial accounts. Contact us for complete tree and lawn care services. 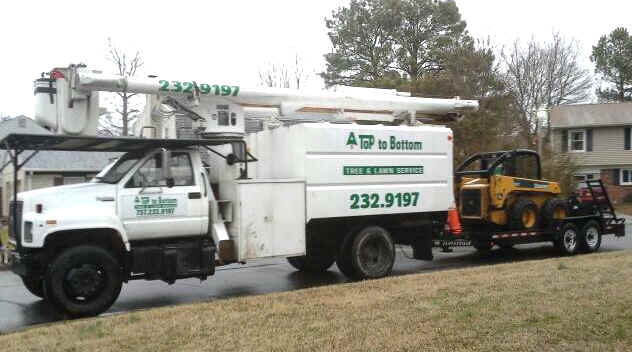 Serving Hamton Roads, Chesapeake, Hampton, Newport News, Norfolk, Suffolk, Portsmouth, Va Beach, and all of Hampton Roads, Va. Some people spell it hamptonroadstreeservice, others spell out some of the words hamptonroads tree service. BUT; no matter how you spell it we are "A Top to Bottom Tree & Lawn Service" company for all of Hampton Roads taking care of all your Tree & Lawn needs. Tree "PROFESSIONAL" in action! Very "DANGEROUS work. Preventative maintenance is the best way to preserve the vitality and longevity of your trees and often times, homeowners wait until it's too late. 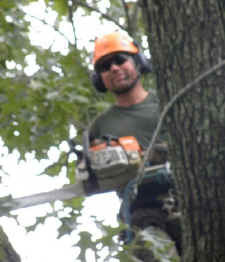 We provide expert Tree Trimming, Hazardous Tree Removal, Stump Grinding, Tree Preservation, Tree Pruning, crown reduction, Cabling, Rod bracing and flexible & rigid bracing services with our highly qualified professionals, giving your trees the best care available. If you have a tree that you suspect may be unstable, diseased, decayed or otherwise unhealthy CONTACT US! Another Website By WEB SITE SERVICE.